The 2nd of the Two Part History of the old Delaware & Hudson mainline between Albany/Schenectady and Binghamton, NY. Taibi continues his story of the D&H and its connections to all of the towns served between the "City of the Hills" (Oneonta) and the "Parlor City" (Binghamton). 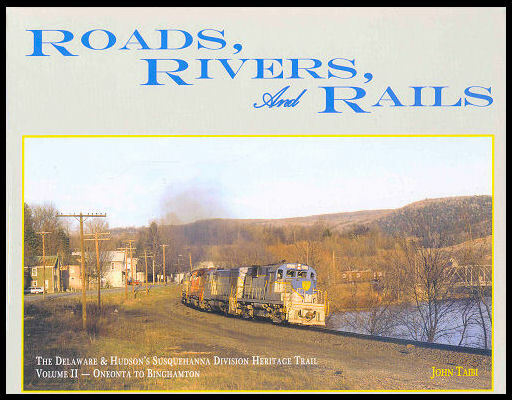 This book contains more than 600 first generation color, sepia, and black & white photos - from vintage stereoviews and postcards to 2013 color photographs of the current owner Canadian Pacific Rail sharing the steel ribbons with Norfolk Southern. Vintage D&H steam and early diesels to the most modern motive power, in addition to Union Pacific and BNSF run-through power make numerous appearances. Hard cover.